A surface and upper trough will pass over NSW Thursday into Friday. Widespread storms are possible. Please use this thread for discussion on these dates rather than the current active thread. what do you think the chances are of a storm (worth getting the camera out for) hitting the gold coast tonight is? It seems to be brewing out west, BOM just issued a severe storm warning for places out near boonah. 28/22 78% Feels like 32.4 from my weather station. Pretty hot and humid now. Nice cj's here out west with some powerful looking updrafts. bring it on storms! From the Brisbane sounding earlier today, the windshear is quite poor in the lower 4km of the atmosphere, but quite strong higher up. This means slow moving cells with big anvils. The instability is not strong enough to compensate for the weak low level winds - evident in what we have seen in coastal parts already today - smallish isolated activity - though still capable of hail. I haven't looked into what the potential for this evening is, but it looks poor atm. There was an inversion on the Brisbane sounding at 300 hPa so storm tops are levelling out at about 10-11km - much lower than earlier in the week. Inland the shear profile is similar but it's a lot more unstable being closer to the upper trough (colder upper temps) - hence the nice big cells in some parts this afternoon. Michael, from what is seen on the Visat images in the past hours how high would the tops of those severe storms be, they look fairly large. 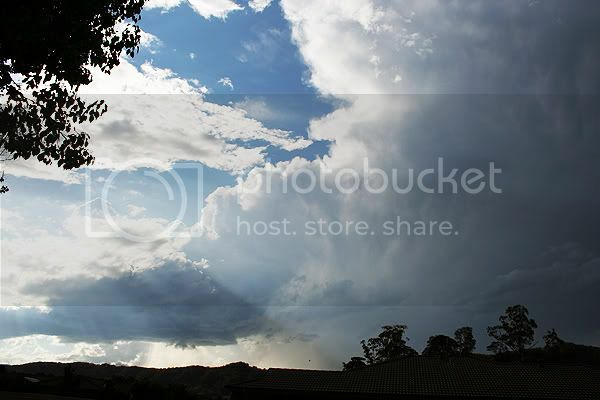 A few pics of the thunderstorm which crept along the Richmond Range west of Casino and Kyogle this afternoon. It sure put out an impressive anvil and gave several decent updraft pulses with interesting base lowerings, but overall remained a bit mushy. Interestingly, the anvil thunder was constant. I saw just one fully branched CG come from the top of the storm in front of the updraft. Issued at 1:43 pm Thursday, 11 October 2007. Severe thunderstorms may produce damaging winds, very heavy rainfall, flash flooding and large hailstones in the warning area over the next several hours. At present a single thunderstorm cell which may be marginally severe is headed in the direction of Kyogle. Hi Mike - yes - the inland cells look very nice on VIS ! This is what we got today, its not much. Heard some thunder at least. Pretty much those cells on Moree radar heading towards NorthEast corner during tonight with some lightning show! Bring it on! Yes Michael its incredible on vis sat. Large tops! Edit: Walgett has wind gusts of 85km/hr out of this line. Collarenebri had gust of 92km/hr in same line. 10.3mm of rain at Lightning Ridge in 25minutes. Appears to be that line going towards northeast corner! What is Visat? How do we get onto this? The more toys to look at the better! We definitely copped the eye of the storm earlier on! Debris everywhere, trees down, dust and mud covered almost everything. We photographed it from the arrival of the quite fibrous anvil which looked quite weak? There were no features other than 3 large and converging rain cores. A few crawlers here and there at the beginning and an awesome show of CG just on the edge of town. I missed out on capturing the CG's due to trying to escape the rapidly growing and approaching dust onslaught! The cells grew nicely though the CG activity died off somewhat? I think the rain measurements are accurate (as you'll see from my pics when I get them up) 10-15mm in 20mins. The wind would/gust speed would be more or less correct I'd say. We have something on the way soon from the look of the lightning tracker, seems to be 60k's out or so. If it doesn't weaken, we may be in with another show! I'll have to keep you all in suspense until I can post the images! The power is flickering again while I'm typing this, so I'll have to leave it here guys! Take care if your still out chasing tonight! Wow, that NE-heading line just passed over the top of Narrabri and that was great fun! 98km/h gust at the airport and one of our other weather stations had a 72km/h gust. Both had around 15mm in 15 minutes and another had 13mm. Someone just emailed us with a 40mm total from the day! The first time we've had rain coming down in sheets for a long time. Also some pea-sized hail amongst it, possibly more north of town. We had another thundertsorm pass through here 1230 to 1am. Some very close lightning including CGs, but less than 1mm of rain due to the speed the line of activity was moving. Quite gusty winds but nothing severe. Not sure what time it was here but i remember getting woken up early hours to some very nice lightning not the closest but fairly close, and a nice 'mini' downpour that lasted for about 10 mins and the whole storm all up bout 25 mins till the lightning faded out to sea. Wind gusts up to 65km/hr here with 7.7mm of rain from thunderstorms after midnight. I missed the lightning because I fell asleep. Today setup looking good, lifted index down to -7, CAPE averaging 1600 and the shear looking complex. What are you opinions for today storms anyone?